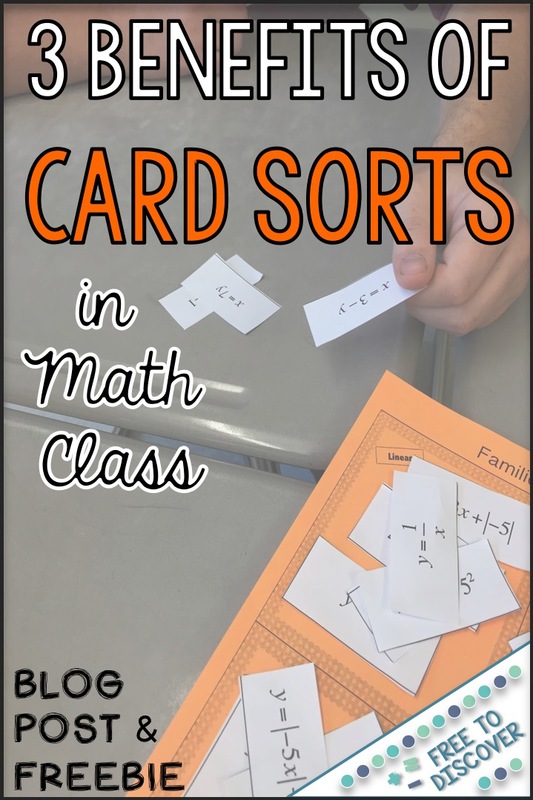 I recently started using card sorts in my eighth grade math classroom. Using card sorts has really had a very positive impact on my students. Card sorts require students to look for overarching patterns, making them great summarizers at the end of a lesson. I recently had a jigsaw lesson where students each graphed a different function and then discussed patterns within the various families of functions. After students had completed the jigsaw, I set each group up with a card sort (available here) where students sorted equations into four families: linear, quadratic, absolute value, and rational. Based on the lesson, they were able to recognize the characteristics of the equations and then classify the functions. The card sort was very effective for jump-starting discussion. Students consider one card at a time and pick a category. If there was disagreement, they had to defend their decision with evidence from the characteristics of the equation. In many groups a leader emerged, but I modeled for students the type of discussion that I wanted to see to ensure all students were engaged in the activity. Very impressive results! Whenever possible, I try to incorporate hands-on learning activities. There are countless benefits of engaging students in “doing” activities, as opposed to “listening” and “seeing” activities. The process of having to think about each function, make a decision, willingly make a change if needed, and arrive at an end product is a much more effective process than having a direct instruction lesson in which I summarize and a couple of students participate verbally. 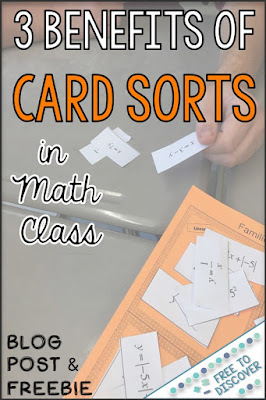 How do you use sort cards in your math class? Do your students enjoy using them? FREE for my blog readers! Stop by my TpT store to see all of my other card sort activities!